TAFE NSW Digital Machine Learning Specialist David Dean discussing the new supercomputer and its application for student learning today at the TAFE Digital HQ in Armidale. NORTHERN Tablelands MP and Minister responsible for TAFE NSW Adam Marshall today officially pushed the button on a new supercomputer at the TAFE Digital Headquarters in Armidale, launching a mega-modern new learning tool to support online students across the State. The NVIDIA DGX station, pronounced en-vid-iah, a $65,000 personal supercomputer and the first of its kind in Australia, has been commissioned after arriving in the country at the end of last year and will officially begin a technological revolution for students, educators and online TAFE courses. “This is an awesome advancement,” Mr Marshall said. “It’s revolutionary for education in this state and will identify how to keep students engaged in their courses and what needs to be changed or tweaked to make learning more effective for them on an individual basis. “The computer uses machine learning and artificial intelligence to make predictions about the types of support students need to successfully complete their studies. “The computer also examines millions of rows of complex data to identify how to change or organise course materials to make learning more effective. Mr Marshall said the latest addition further cemented Armidale as a leader in new and emerging technology. The digital learning hub, a $6 million digital headquarters for TAFE in NSW, opened in March this year with Armidale chosen because of its fibre to the premises NBN connection and its central location to other regional towns. “Basing the hub here has been an incredible boost to regional education, to local employment and to the vocational education and training sectors,” Mr Marshall said. 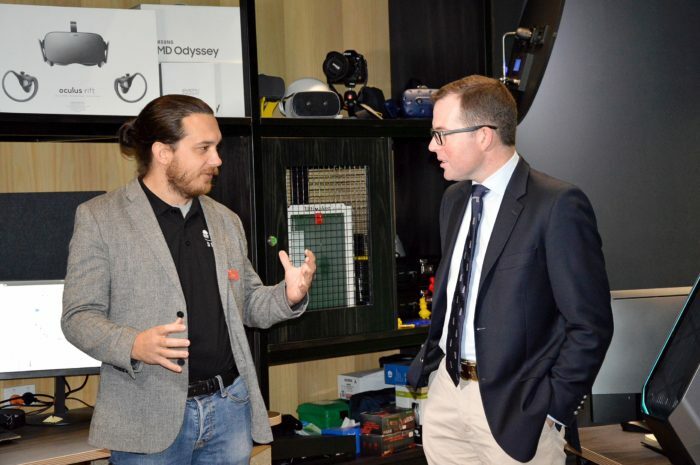 Mr Marshall said TAFE Digital offered students more than 250 new courses, ranging from wool classing to online cybersecurity and the Digital Headquarters is responsible for producing content for these courses, using the latest in virtual reality, augmented reality and simulation.